Diana - Now, it's time to find out what's been happening in the world of technology as we join Meera Senthilingam who is going back to the age of the steam engine in this month's tech update. Meera - So it's been a while since we've had a tech segment, and so I've come down to Television Centre here in London. And it's a lovely day, so I'm joined outside in the grass area with our resident tech expert, Chris Vallance. Hello, Chris. Meera - This month, Chris, you're taking us into the past but using modern technology. Chris - Well, I thought I'd talk about something a little aesthetic. It's a bright sunny day. Let's talk a bit about art perhaps more than technology. I'll talk about a very popular online movement called "steampunk." It's a science fiction fantasy sub-genre. Very popular online. Essentially, it imagines what would modern technology be like if it had the aesthetics, the feel of Victorian technology, the classic age of steam? 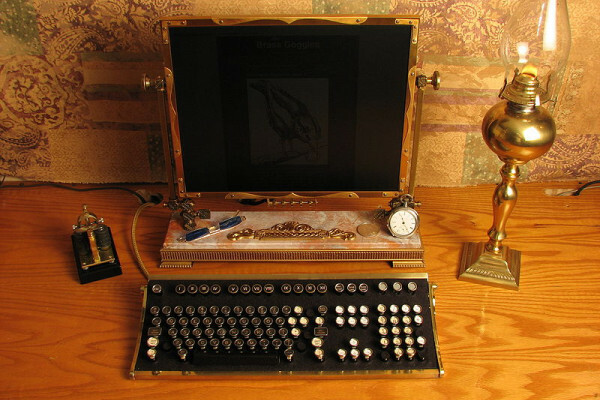 And so you get devices, creations that are essentially technological things but rendered in a Victorian style. Lots of brass, they have dials; they have levers. It's all a bit Jules Verne and H. G. Wells. It's 20,000 Leagues Under the Sea. There are lots of metal. And these two things, they're often just artistic things. Sometimes they function; like people will, for example, recreate computer keyboards but make it look a bit like old typewriters or they'll have USB keys with little pistons and little brass styles. It's a big event a couple of weeks back in London where it's one of the big annual jamborees for people interested in steampunk. And I went along and I spoke to some of the artists and steampunk fans who turned up. Cyberfi - Oh, hello, I'm Cyberfi. Chris - Cyberfi? Ok, now I'm going to describe your costume. You're entirely silver. You're surrounded by a halo of what look like hypodermic syringes. Your face is covered in rhinestones. What's it all about? Cyberfi - Well, I tonight - you see, it's a great exhibition here today, so I'm exhibiting my latest invention, which is a tremendously exciting craniometre, which I believe will transform society. You see, a craniometre is the secret to eternal youth and beauty! Chris - I suppose it's loaded with Botox. That's what you're saying? Cyberfi - Well, it's somewhat pre-botox. It's pre-botox. It's a little bit more painful than Botox. It does involve mild electric shocks. Jaz - My name is Jaz Delorean. I'm the writer and lead singer of Tankus the Henge. We're a band from London and we have a steam piano and an accordion and lots of eclectic influences. Chris - Steam is your career, your vocation? Jaz - Yeah, it is. It certainly is. I drive a set of steam yachts from Carters Steam Fair and there are only two of those in the world. Chris - What is a steam yacht? Jaz - A steam yacht is a fun fair ride. The one I drive is from 1901. And it's the nearest thing that mankind has got to building something that's alive. Mr B - My name is Mr B the gentleman rhymer. I'm re-connecting hip hop and its ilk and other parts of popular culture to the Queen's English manners . Basically I've invented something I call Chap-hop. Chris - Chap hop? What is chap-hop? Mr B - Well, chap-hop is exactly that. It's hip hop but I'm an English gentleman, I enjoy cricket and I enjoy smoking my pipe and we have to keep it real. So I can't be rapping about the ghetto and things like that. Mr B - I'm straight out of Surrey. Shady old Surrey, that's where I'm from. Chris - Very good. I should describe your outfit, a very fine, double-breasted suit - no, a single-breasted suit, with a nice waistcoat, a nice narrow tie, a wonderful moustache. You must have spent quite some time curling that. Mr B - I have no wax on it whatsoever. It's curling up but I can curl it down. I can go a little bit biker with it if I wish. Chris - It's a little bit semaphore. Mr B - Exactly, yes. I can do moustache semaphore with it, you know. I can land planes with this little thing. Chris - Some steampunk enthusiasts and artists. Meera - Is this a relatively new movement, Chris, or does it have quite a big following already? Chris - It's been around for a few years and it does have quite a big following. I mean, there are steampunk authors, there are films with a very strong steampunk aesthetic. There is a lot of Victorian technology that can be quite easily updated. And people love doing that. I mean, if you think about the early computer, for example, Babbage's difference engine, you know, it's all cogs it's all brass, very easy to imagine that as, you know, something that might have persisted into the future. So, yes, it does have a big online following. Meera - Now, as well as seeing these things online, are there any future events where people can see some of these objects and these gadgets in the flesh? Chris - There's a lot of activity going on throughout the year. You can see exhibits of work, you can watch the bands that tour and, perform in a steampunk style. It isn't as big as some science fiction genres, it isn't as big as some literary and artistic genres, but it does have a sizeable following online. And there are even people who sell steampunk stuff. So, you know, there's a lot of stuff to explore out there. Myth: Can diamonds be made from coal?